Here is a cluster frame I made with the PTU kit Love Scars by Crystal's Creations. For February all of her creations are only $1.00! Go to her blog to find her stores! Please do not share this. Just direct others here to this post to download! Hope you like it... tell me what you think! Here's a tag I made with it and a tutorial. I used a tube by Ismael Rac that requires a license to use, click HERE to get that. I used a few more elements with the Love Scars kit. 1. Open the cluster frame, IMAGE>CANVAS SIZE> 800 x 800. 2. Open paper 3 from kit. Right click in layers box-ADD ALPHA CHANNEL. 3. Open the circle masks- Kaci's 2nd. Go to COLOR>INVERT and LAYER>TRANSPARENCY>COLOR TO ALPHA. Right click on mask- ALPHA TO SELECTION, then click on the paper 3 layer in layers box to make it active. Go to SELECT>INVERT and EDIT>CLEAR. Delete original mask now that paper is the mask. 4. Open the Naughty masks- Sabine's 3rd. Go to COLOR>INVERT and LAYER>TRANSPARENCY>COLOR TO ALPHA. Then go up to COLOTS>COLORIZE to a red shade. You may have to scale these masks a bit to get them the size you like. 5. Open the tube of choice. Add all copyright info- copyright symbol, artist's name and website as well as license if applicable. 6. Open element 9. Duplicate and flip and set above masks in layer box on each side of frame. 7. Open element 37, scale to 492 x 37 and place above the original in frame. 8. Add drop shadows to tube and elements. 9. Open element 2 and place behind the front tube. 10. Add your name. I used a font called Pea Roxygirl. Add drop shadow. 11. Save as .xcf to be able to go back in amd make necessary layer changes. Crop using rectangle tool ans save as .png when satisfied with your creation! Thank you so much for this post. 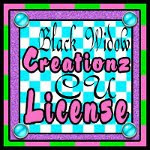 I want to let you know that I posted a link to your blog in CBH Digital Scrapbooking Freebies, under the Page 1 post on Feb. 04, 2012. Thanks again.